I love music – always have. I listen a lot – while I’m working, while I’m cooking, while I’m driving, running, if I’m not sleeping there might be some music in the background (right now, it’s Bob Mould’s new album, “Sunshine Rock”). But does my cat enjoy it? Well, given that I like loud music of the punk rock type, probably not so much. In 2015, a study of anesthetized cats showed that compared to heavy metal music and pop music, when cats are getting spayed, they would prefer a little classical music. This was determined by measuring each cat’s respiratory rate and pupil dilation, both of which were lowest when cats were subjected to classical music (for the record, the musical choices were ‘Adagio For Strings (Opus 11)’ by Samuel Barber; ‘Thorn’ by Natalie Imbruglia; and ‘Thunderstruck’ by AC/DC.). More recently, researchers looked at whether music might reduce stress for cats receiving a medical exam at the veterinary office. Further, they were interested in whether “cat specific music” would provide benefits compared to classical music or silence. The study, “Effects of music on behavior and physiological stress response of domestic cats in a veterinary clinic,” was recently published in the Journal of Feline Medicine and Surgery. I’ve written about “Music for Cats” previously – its distinguishing factors perhaps not so much the quality of the tunes, but the sounds created for their similarities to purring and other sounds that cats might find attractive (like squeaking noises and suckling sounds). To test the responses of cats, the researchers tested 20 cats with all three musical conditions (cat music, classical music, silence). Each condition was tested on a different date (with two weeks between each test). When cats arrived at the veterinary hospital, they were placed in an exam room with the musical stimuli for 10 minutes. Then they were given a basic physical exam, including the collection of a blood sample, while the music played on. A “Cat Stress Score (CSS)” was recorded at three time points: before the music began, during the physical examination, and after the music was turned off and the physical exam was over. Cats were also given a “Handling Score (HS)” during the physical exam by the person conducting the exam. Finally, that blood sample was used to look at neutrophil:lymphocyte ratio (NLR). NLR has been associated with stress and distress behaviors in other species, although in a study of rats, it was associated with chronic, rather than short-term stress. For a little more context, the Cat Stress Score is a commonly used measure looking at various aspects of cat body language. The score can range from “1” (fully relaxed, for example, laying on side, eyes closed, head on the surface, sleeping) to “7” (terrorized, crouching and shaking, flattened ears, yowling). The Handling Score rates the overall demeanor of a cat, ranging in possible scores from “0” – “friendly and confident” up to “25” (overtly aggressive), with three categories in between: friendly and shy, withdrawn and protective, and withdrawn and aggressive. Results suggested that the Handling Scores and Cat Stress Scores were lower during the physical exam when cats were listening to “Cat Music” compared to classical music and silence, which were not different from one another for either score. 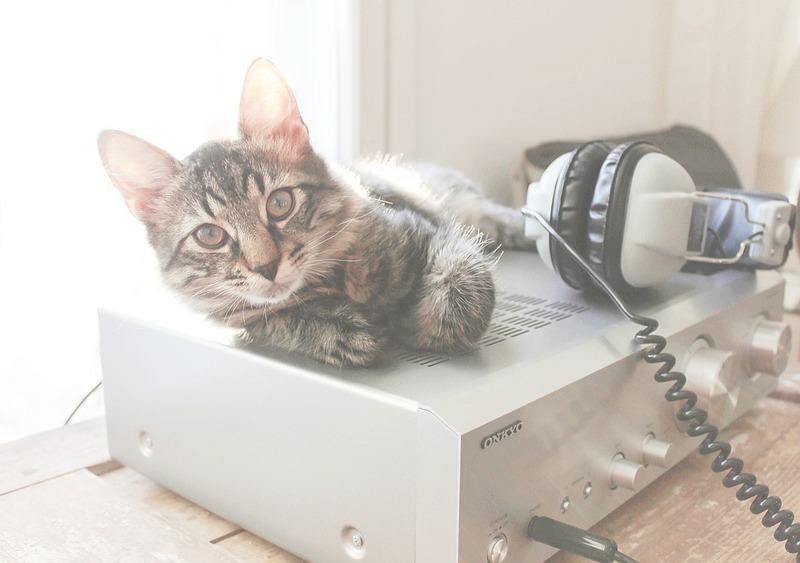 Cats who had been listening to “Cat Music” also had lower CSS’s during the post-physical exam period. From the graphs, it appears that cats listening to Cat Music had average CSS’s of 2 (weakly relaxed) compared to the other cats who scored 3’s on average (“weakly tense”). The handling scores of all cats averaged around 2, on a scale of 1-25, all falling well in the range described as “friendly and shy.” There were no differences found in any of the groups for the measures of NLR. The study provides some evidence for the positive responses of cats to “Cat Music.” The one caveat being that overall, although “statistically significant,” the actual differences between the groups were relatively small (meaning that the differences in CSS and HS scores were 1-2 points on average). It is also unclear why the different musical conditions did not lead to differences in NLR in any of the cats. All cast had slightly elevated NLRs compared to normal averages. The authors hypothesize that perhaps the car ride before the veterinary exam may have increased the NLR in all cats, making it hard to determine the effects of the music. Despite small effect sizes and no change in NLR, anything we can do to reduce stress for cats during veterinary exams, is worth considering! In addition to other stress reducing techniques (such as non-slip mats and towels on exam tables, examining a cat in their carrier if that is where they want to be examined, minimizing wait times in lobbies, and providing cats with treats if they are willing), Cat Music is another tool that veterinarians might want to add to their exam room toolbox! Kessler, M. R., & Turner, D. C. (1999). Effects of density and cage size on stress in domestic cats (Felis silvestris catus) housed in animal shelters and boarding catteries. Animal Welfare, 8(3), 259-267. Mira, F., Costa, A., Mendes, E., Azevedo, P., & Carreira, L. M. (2016). Influence of music and its genres on respiratory rate and pupil diameter variations in cats under general anaesthesia: contribution to promoting patient safety. Journal of Feline Medicine and Surgery, 18(2), 150-159. Swan, M. P., & Hickman, D. L. (2014). Evaluation of the neutrophil-lymphocyte ratio as a measure of distress in rats. Lab Animal, 43(8), 276. Zeiler, G. E., Fosgate, G. T., Van Vollenhoven, E., & Rioja, E. (2014). Assessment of behavioural changes in domestic cats during short-term hospitalisation. Journal of Feline Medicine and Surgery, 16(6), 499-503. Posted in cats. Tags: cat behavior, Cat Stress Score, music for cats, NLR, stress, veterinary visits on February 18, 2019 by Mikel Delgado.